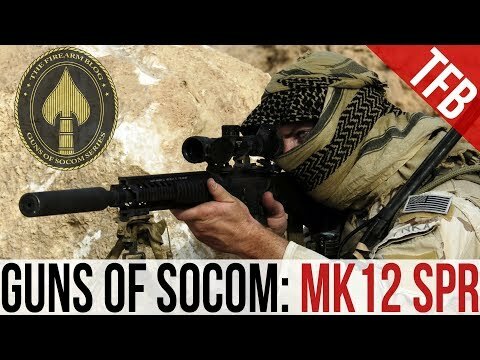 Guns of SOCOM, Ep. 2: In this episode, James introduces viewers to the Mk12 Special Purpose Rifle and AEM5 Silencer. The Mk12’s primary purpose was to provide a light, precise rifle that could be used in close-to-medium-long range combat. In other words, it needed to be more effective and more accurate than the M4 while being almost as maneuverable, but with an optic that could be dialed down to engage at closer ranges, or zoomed in to reach out to longer distances. Although the Mk12 was originally designed by the Navy at NSW Crane, it made its way into the hands of all special operations units and became a favorite of U.S. Marines in Middle East combat zones. James’ friend Chris was kind enough to volunteer his beautiful Colt/KAC combo Mk12 for use in this video, which was shot at the NOLATAC Training Center in Avondale, Louisiana. Ron Allen of Allen Engineering graciously sent an AEM5, the suppressor this gun is issued with, for use in this video.